One of my favourite product finds in a very long time. I can't believe I didn't buy it sooner. It has reignited the blogger in me though. I neglected my blog for a long time, updating here and there, but mainly being overwhelmed by university work. Once I'd got that under control I focused on my youtube channel, but there is something relaxing about sitting down to write a blogpost and I've missed it. Plus, sometimes I've got a bit spot on my chin (YES RIGHT NOW!) and I don't feel like being on camera. Anyhoo, back to the product... The Bumble and Bumble Surf Spray is a bit of a cult product but I'm not one to listen to the hype and run out and buy the new 'it' product that's doing the rounds. I did however stumble across this while shopping with the lovely Abby. The girl at the counter tried it on my hair and I immediately fell in love with it. It creates a messy, texture that gives you that 'I just woke up looking this good' style without being crusty or stiff. 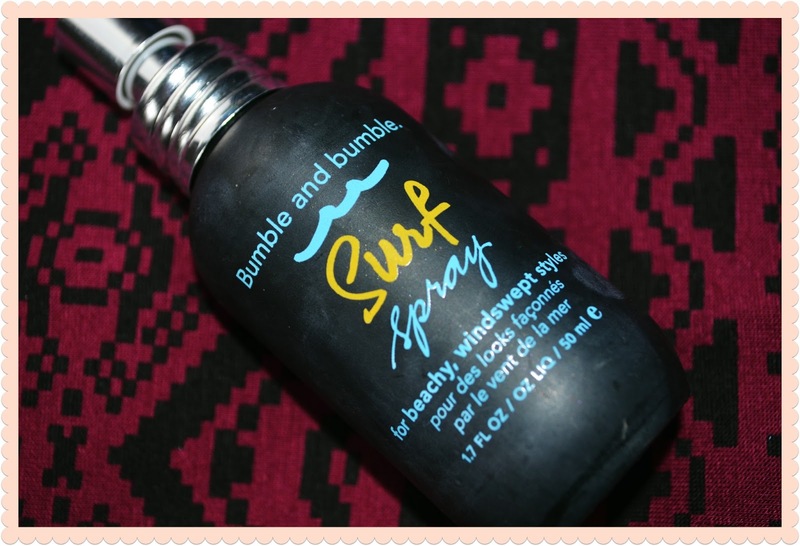 That's the main problem I've had with most other 'surf sprays' is that they are either too weak and watery that they don't really do anything or they work but feel like a cheap hairspray. It works better with heat, either a curler or diffuser but you can use it alone and just scrunch. I tend to add a few spritzes over my curls (while they are still warm) then shake my hair around. I'll add more if necessary but it's better not to over do it. I purchased the smaller size of 50ml for £8.50 but you can also buy it in 125ml for £20. I wanted to try it properly before I purchased the larger one, but once this one is used up i'll pick up the big one. You can buy it from their website or you can pick it up from one of their stands in boots or salons that stock their products. Hopefully we get some nice weather in the UK this summer so when I work on my 'bikini body' I can rock the 'surfer girl look' on the beach! Don't forget to subscribe to my youtube channel if you want to see my face when it's more presentable than it is today. Hope you've had a good weekend. Happy Sunday! I've wanted to try this for SO long! I've heard so much about it but just never got around to actually trying it, think i'm going to have to pop into Boots this week!